I can't imagine what it would feel like to come home and find my home busted open and valuables missing. The bad news is it is more likely to happen here than in our neighboring states and most of the country. SafeHome.org published a study of the latest FBI crime statistics looking at the number of break-ins by state. South Dakota had the tenth most break-ins in the country, averaging 623.1 break-ins per 100,000. Our rate doubled since 2012 when it was 391 per 100,000. 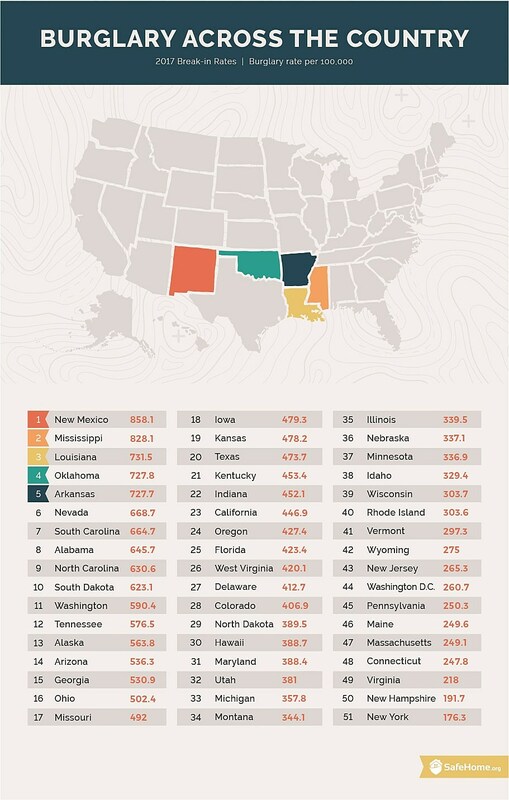 Perhaps the worst part is that South Dakota has more break-ins than any of the cold weather states. The majority of the cold weather states were in the bottom half of the list. Of our neighboring states, the next closest was Iowa at #18 with 479 per 100,000. Then you have to go all the way to North Dakota at #29, Montana at #34, Nebraska at #36, and Minnesota at #37. New York has the fewest break-ins of any state, not just the cold weather states. They were followed by New Hampshire, Virginia, Connecticut, and Massachusetts.